Lets say that you have a large complex worksheet, and it is so slow that you have to turn off automatic calculation to make it usable. Well if thats the case, its already not really usable. To optmize your workbook, the first thing is to find which calculations are actually taking a long time. 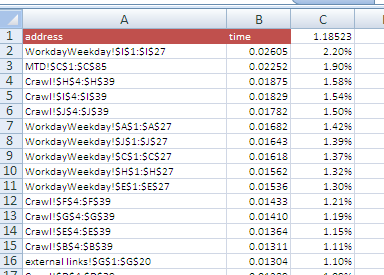 So what we are going to do here is create something that tells you the execution time of every single column in your workbook and creates a log so you can see the columns that take the most time. The output is going to look something like this - showing how long it took to execute the formulas in each column of your workbook. 1. First create a tab called ExecutionTimes, and the headings as above. 2. Now create a module called Optimize, and insert the following Sub. This code is available from optimizeExample.xlsm in the downloads section. This is our main function that will be called for each Sheet in your workbook. Starting at the place identified by the range routput, it will report on the address of each column in the sheet ws, along with how long it took to calculate each formula in seconds. 3. Now insert the following subs which will reference this. rSum.Formula = "=sum(" & rKey.Address & ")"
4. Insert the code for timing the calculation. MsgBox sCalcType & " " & CStr(dTime) & " Seconds"
The sub you will execute is timeallsheets. If you like, create a command button in your workbook and associate it with that, otherwise just run it as is. Why do execution time logging ? Because its a quick way to find out where the problem in your sheet is. If you sort the output you can attack the ones that are taking the longest, and test to see the result. If you need to optimize VBA , you will find information and downloads for a project which creates a fully working automatic code profiler here. Charles Williams, Decision Models Limited has a lot of advice on optimization at these following links.